It may be how little is known about Calvin C. Phillips that keeps his memory alive. The architect came to Tallahassee from New York or Pennsylvania around 1907 or 1909 and died here in 1919. By legend, he designed buildings for the Paris World’s Fair in 1889. 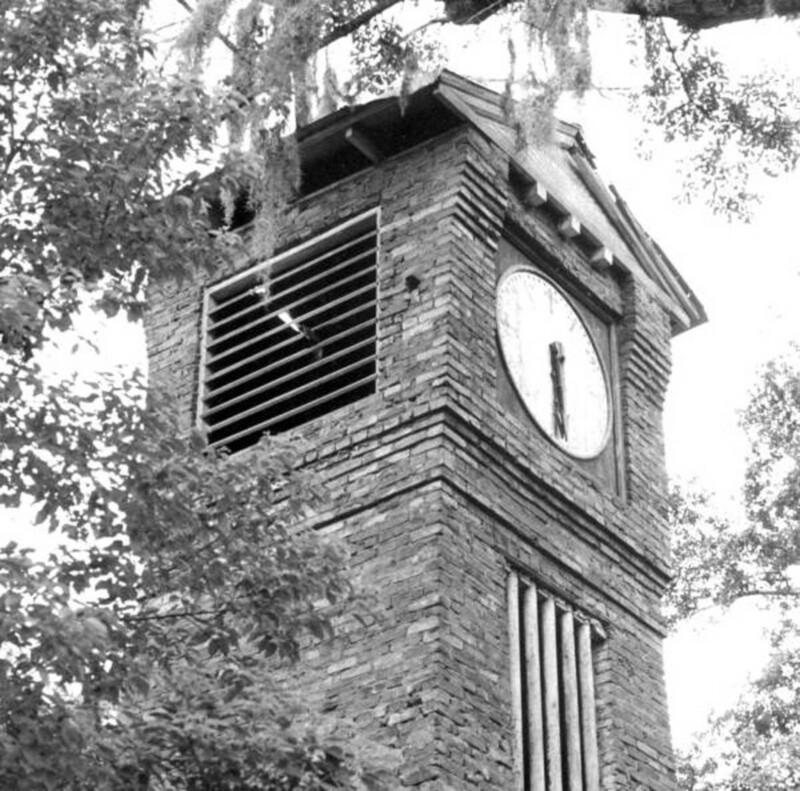 “Perhaps the most extraordinary person who ever lived in Tallahassee was Calvin Phillips,” began Elise Kendall, writing in 1933 for the Tallahassee Daily Democrat, in an article about Phillips’ home, a “clock house” he constructed in the present-day All Saints neighborhood off South Macomb Street. Those who still remember the building sometimes call it the clock tower. Kendall went on to describe the building as made of brick, stone and hand-carved woodwork, as well as the clock’s mostly wood construction and 12 chimes. Over the years, other writers (including this one) would add to the lore about the place, with the liberal use of qualifying phrases, like “It is said that …” For some, the clock house was simply a home. Hugh Paul Corley lived in the clock house as a boy from 1952 until 1959. He also said that his grandparents’ house contained old blueprints, possibly belonging to Phillips, that he wished he had kept.In a 1960 article, the Democrat spoke to another family who lived in Phillips’ house. In its later years, the building was used as a squat. Origin stories Phillips’ reputation as a builder mostly centers around two medals his daughter gave to Mrs. Thomas Hood, the widow of Sen. William Hodges, Phillips’ friend: one medal from the Republic of France and another from the Pennsylvania State Agriculture Society. According to court records, Emma E. Kirk traveled to Tallahassee in December 1919 from her home in Scriba, New York, to settle her father’s affairs. Soon after Phillips’ death, the Fulton Patriot of Fulton, New York, printed a brief account of his life, noting that he is buried in “the family vault” and that on the date of his funeral, flags were flown at half-staff in Tallahassee. As Phillips’ family never lived with him in Tallahassee and he rests in his mausoleum alone, this obituary raises questions for Claude Kenneson, an archivist and member of the Tallahassee Historical Society: “He seemed to be separated from his family, but then why print an obituary in the place where his wife and family are? Do they still claim him?” No obituary for Phillips could be located in Florida papers. What happened to his home is another mystery, perhaps by design. The clock house was in poor shape by the time Mr. and Mrs. Henry C. Blaine put it up for auction in 1974 under the condition that the new owners preserve the structure. Madison Center Ltd., the investment firm that bought the clock house and its lot, planned to renovate it but did not. Sometime in the early ’80s it disappeared, but no records exist of who dismantled the building or where its parts were taken. While not immediately remarkable, the building is larger than other graves and incorporates architectural flourishes such as Doric columns and an Eastern-inspired dome. Raising questions Phillips’ mausoleum caught the eye of former Florida governor LeRoy Collins, whose 1985 editorial “The Tale of a Man Obsessed with Time” contributes much to legend. For Collins, Phillips’ life represented an ontological struggle, in which agreed-upon human constructs — such as time — can be used to overcome the chaos of existence. Collins was charmed by the spookiest of Phillips myths: that he was able to predict the time of his own death, and upon the completion of his mausoleum, the architect laid down in it and died. Phillips’ skull was stolen from his mausoleum in 2000, and the plate metal door is now bolted closed. Donald Draughon, author of the website “Tallahassee Then and Now,” first became interested in Phillips as a neighborhood kid taking shortcuts through Oakland Cemetery. He called the Collins article “30% fact and 70% embellishment” but also noted that few facts can be known about Phillips.